A mix of female blues classics revamped with modern day musical influences . And originals that lyrically tell great stories reminiscent of the blues of the past. 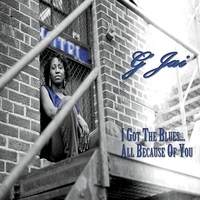 I Got The Blues... All Because Of You is an eclectic mix of female blues classics and of originals written by G'Jai. This cd will make you reminisce of a time when women reigned supreme in the Blues world. There were quite a few Queens in the blues kingdom during the early 1920's. These women helped shape and blaze the path for future blues vocalist like G'Jai to be able to follow. G'Jai has taken inspiration from some of those queens like Alberta Hunter, Bessie Smith, Ma Rainey, Clara Smith and Lucille Bogan to name a few. On this cd G'Jai gives accolades to the fore-mothers of the blues by revamping some blues classics like "Chirpin' The Blues", while establishing a link to the present with her originals like "Little Lady From Detroit". A "Must Have" in your CD collection! witty, sassy and telling it like it "is"! he is gone! I feel the strength and soul in the artist I look forward to the next CD to drop!